Information: Molded in white, includes brand new Firestone narrow pie crust slicks and Goodyear Blue Streaks, plus artwork of box lid photo. In 1973, AMT revised the original Ala-Kart tooling into a classic hot rod for this issue while also retaining the stock version, so two complete cars could be built. The tooling for the rod was later found to be incomplete, but AMT has now recreated the needed parts to make the "Mod Rod" available again. 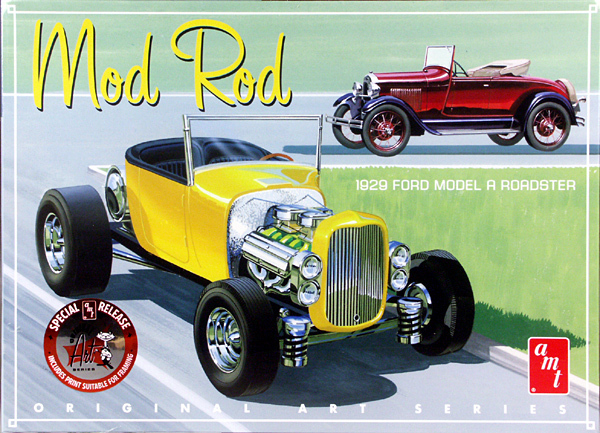 Like the original "Mod Rod" kit, this kit includes all the parts to build a stock Model A roadster or vintage racer AND the street rod which can be built as the "Mod Rod" shown on the boxtop or as the full-fendered rod shown on the box side.